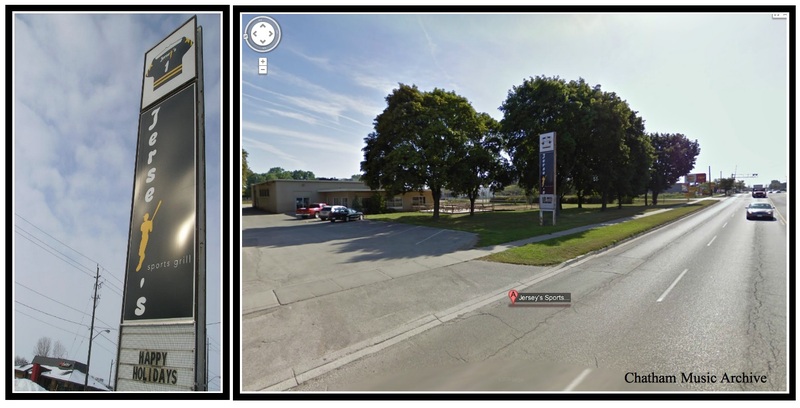 Address: 304 St Clair St.
Notes: Formerly the Legion. on St. Clair Street, Champz brings live music on the weekends with Rock, Blues, & Jazz. 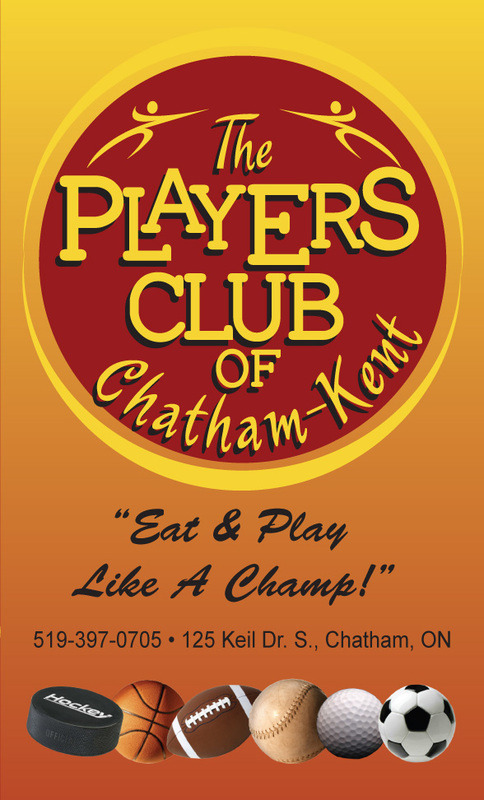 Bio: A new venue has arrived in Chatham…Lots of pool tables, dart boards,4 big screens, lots of flat screens, a mouthwatering menu, live classic rock/blues/jazz music every Friday, live country music Saturdays, and the coldest beer in town. Let us host all of your special events. We will make your day worry free, food made on site by Chef Opie!! A set menu or customized to your likes. Fully stocked bar and staff to take care of all your needs. Update March 2019: Champz closed it’s doors in early 2019, due to unforeseen circumstances. Posted by Chatham This Week 2016/07/11. By: John Rhodes. * Before becoming known as the Aberdeen Hotel, it had spent 40 plus years known as the McNaughton Tavern. * It can be traced back to the late 1840s – early 1850s. Known most for selling Whiskey than renting rooms. During the 1970’s, Country music was huge, and the Aberdeen was a popular venue featuring live music most days of the week. During the 80’s, it became a hot spot for live hard Rock & Roll. Through it’s final years (1990-1996), it had began to show its age. As of today (April 2017), The building still stands, being used a storage space for Western Equipment. Picture Source: Bechard family. (Calixte Bechard owned it for many decades). The picture is from a postcard produced for the hotel, which I estimate to have been created between 1910 and 1920. John Rhodes. From the early 90’s to 2004, EightBall was the main consistent provider of live entertainment with variety. Owner Tony Almeida was simply the nicest bar owner in Chatham and a true supporter of the community and its local bands. Tony decided to retire after 25 years in the business which began as EightBall simply being a Billiard hall. The venue has since changed its name to Twisters, and a few others before becoming Encore, which it is now known as in 2010. 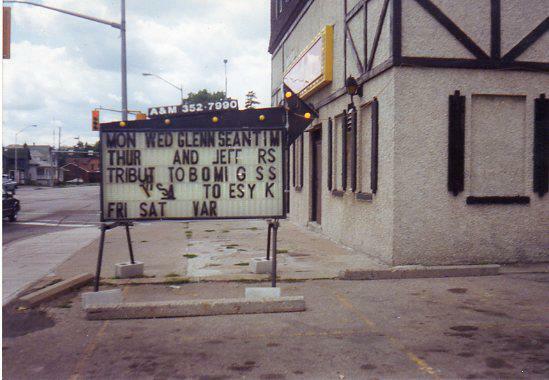 Over the years, the bar hosted acts including Finger Eleven, Great White, Quiet Riot, I Mother Earth, Nazareth, Big Sugar, The Trews, 54-40, Econoline Crush, Default, Theory of a Deadman, Bif Naked, Rusty & many, many more. EightBall began hosting local bands to play shows back in the mid 1990’s. They were often given Sundays to do their thing. Otherwise, the young kids would normally have to rent a hall (JC Hall, KBD Hall, CAW Hall, Polish Hall, & the Legions) which was a big burden and risk to take for these young kids. Tony did his best to share his good fortune and develop a good community spirit amongst all club goers, whether it be rap, dance, country, techno, metal, or foam parties. Like all bars, it had a few slow years caused by various reasons, but mainly, it held its ground as the top entertainment venue in Chatham for the majority of the time. Personal Note: I have worked with Tony for many years performing in bands (Foster Child/ Janet Theory) & he sincerely was the best owner, taking care of the bands he had play at his club. He took care of his customers, staff, and hired entertainment with respect. He gave opportunities to young new acts, and in return, we did our best to try to make the shows extra special so that the venue would be packed and everybody wins. Tony remarked “I certainly miss all the people that I used to work with and of course, The group Foster Child/Janet Theory was sincerely one of the best to work with. I really miss you guys and will never forget some of the good times that we all had! I will always be gratefull for all the effort that you guys did to help Eightball become what it did back in the day”. A few of the bands that performed here were:54-40, Ashes of Soma, Betrayer, Big Sugar, Cage 33, Carpedeim, Clark Nova, Closer To Closure, Crazy Babies, Crutch, Default, Driving Lester, Dropping Poppies, Ego Seed, Fat Doug & The Sinners, Filmores (the)Finding Core, Finger Eleven, First Line Third Planet, Flicker, FLOORrYDe, Foreign Film Stars, Foster ChildGilligans Eye Lid, Halfway There, Hatchet Man Phenomenon, Hollow (the)HorrowShow, Janet Theory, J Englishmen, Joy Drop, Limblifter, Mad Dash Tour, Modena 440, Nerve, Orinj, Power Trip, Quiet Riot, Random Time, Room Without A View, Rusty, Salads (the), Sedated, Scratching Post, Social Code, Source (the), Stutter, Tangled Puppet, This End Up, Toast & Jam, Tranzit, Trole, Typhoid Mary, Wide Mouth Mason, Whaling Band & Whatever. Home: Formerly Chatham, now Salt Spring Island, B.C. Current: Vocalist for the dance pop rock cover band ‘Run For Cover’. 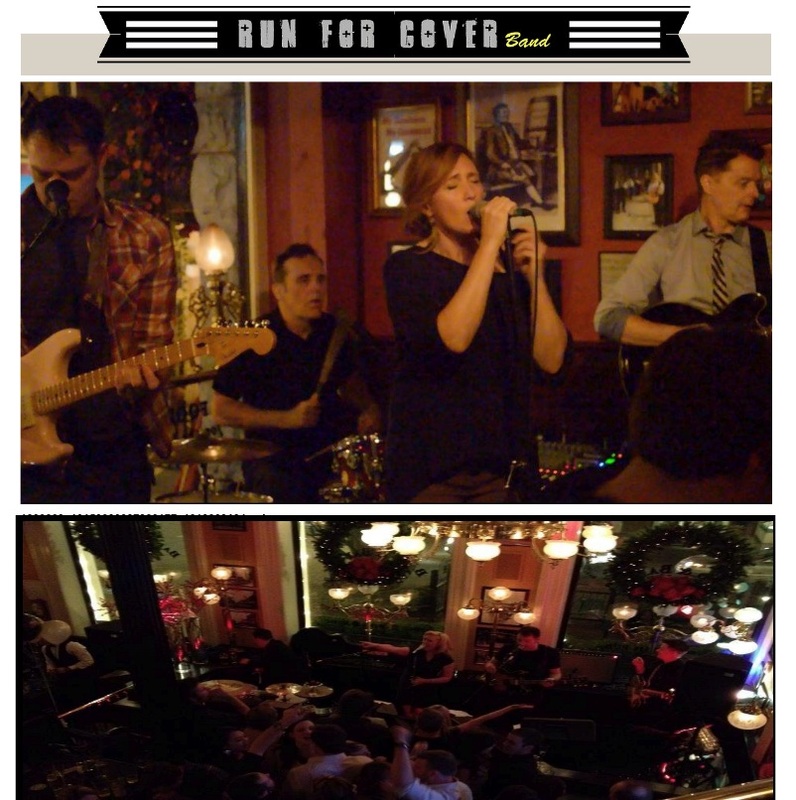 RUN FOR COVER is a pop dance rock cover band based out of Victoria, BC. You can usually find them playing some of Victoria’s best pubs including the Bard and Banker and the Irish Times. The band is based on great singing and feel good music that makes you dance. The RUN FOR COVER repertoire ensures something for everyone playing music from the sixties to today’s hits. Stephanie Rhodes – 2010 – Rhodes to Somewhere. Note: During its run, it was one of the top two choices for live music (mainly cover bands) in Chatham. It was also popular for being decked out with out door volleyball courts. * The venue would later re-open under the name of “The Players Club” for a short while until it eventually closed. The world & local economy took a dive from 2008-2012. * Before becoming Jerseys, it was was named Chappies. 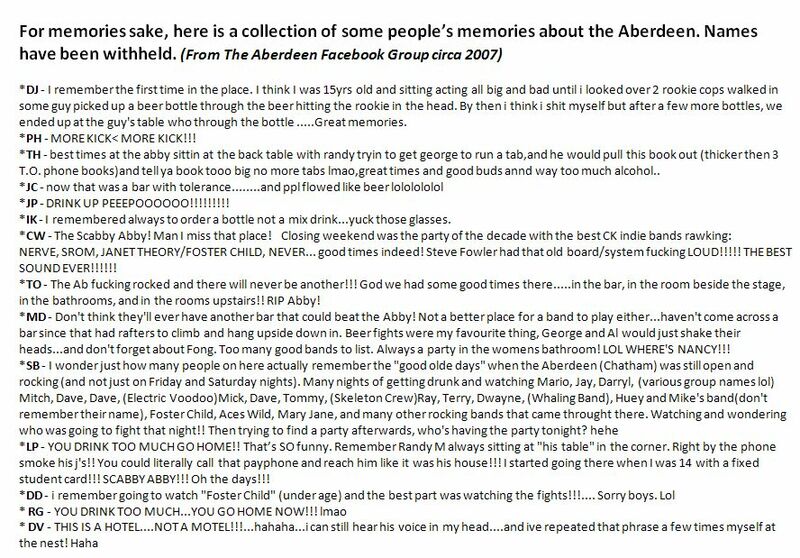 * Aberdeen reunion 2016 info here. 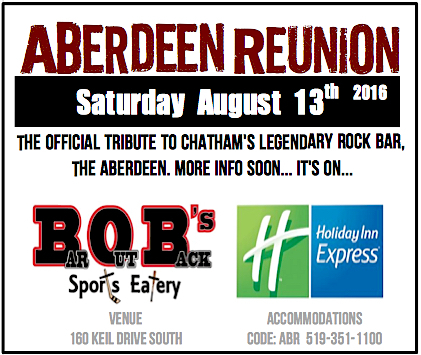 1970’s – Chatham was home to a strong music scene with bands performing at least six nights a week at the Aberdeen. Musicians from all over Ontario join the strong Union in this city. Times are good. Country music rules the day & the Aberdeen is a bar highly respected in the music community. Touring acts from around the world played here when they crossed Ontario. 1980’s – Glam rock takes over. The bar grows rough edges but continues to thrive and becomes a legendary party venue on the touring scene. It can be safely said that no bar may hold more good rock & roll stories than our little watering hole here in Chatham. 1990’s – Live entertainment dwindles down to just three nights a week. By the late 1990’s, the live music bar scene fades & Al & George decide to sell the venue & move. The Aberdeen becomes a storage warehouse for a local business. It still stands today (2011) in all its run down glory. The glory days are over, but the stories will never be forgotten. 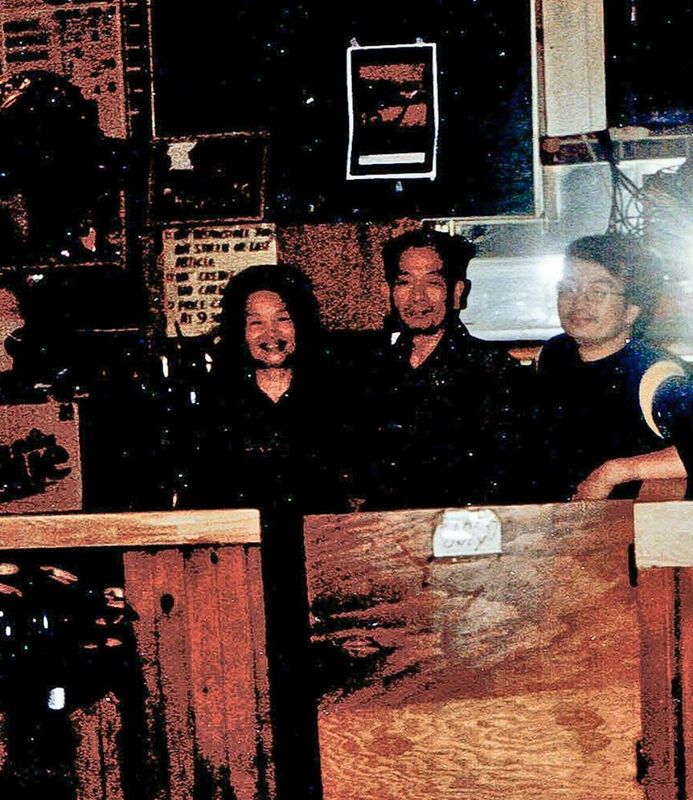 It was simply Chatham’s most legendary bar. 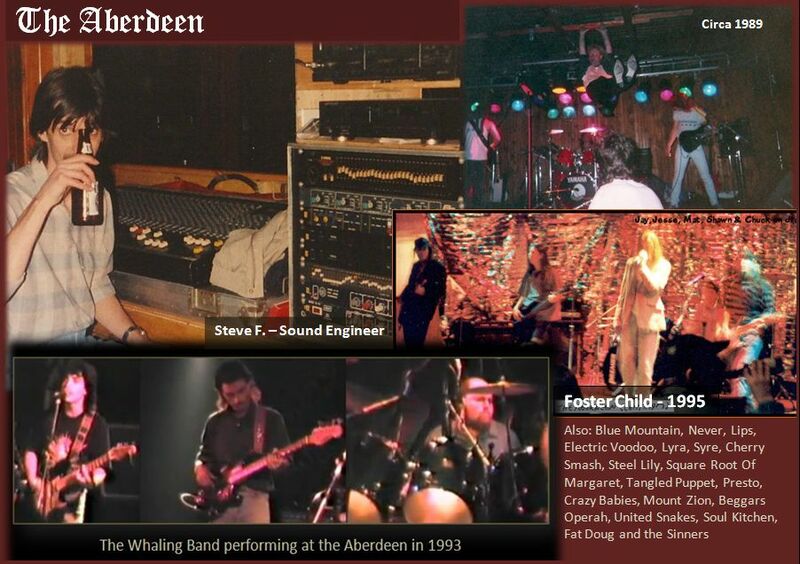 * The Aberdeens final “weekend” of live bands included Nerve, Never, Square Root Of Margaret & The Janet Theory/Foster Child. Mama, George & Al. Good Kind people! If you have any pictures of the venue or Al & George, please send them to us so we can share them. Thanks.